This machine has not worked from day one!!! After taking a day off from work to install this unit on the day it arrived, this machine did not work. I tried a hundred and one things, but the unit still did not work. The next day, I called Whirlpool and they sent out a repairman the following day. The repairman found defective parts in the new unit. The flowmeter and pressure switch were both defective. He called the following week and informed me it would take another 10 days to secure the parts. I called Whirlpool, and when I requested a new machine (after all, I had not been able to wash a single load), they stated that their policy is to repair and not to replace. Thus far, it has been three weeks since I was able to wash at home. After 2 and a half years my motor control board went and Whirlpool will do nothing for us. The machine was $800 and the repairman wants $600 to fix it. This is a Whirlpool certified repairman! I will try to buy the part and fix it myself. Will not purchase another Whirlpool product including Maytag and any other machine they make. Don't recommend buying any of their products. They told me they could do nothing for us. bought in oct of 09 and motor control unit went this week. repairman says $600 to fix! I've had my washer two years and it rarely works properly. Get F35 All the Time! Researching f35 and sud code. Looks like a common problem. What a piece of junk. Buy the cheapest top load you can find. I sure wish I would have! The worst washer ever!! Do not waste your money. I have had it for two months and already the water valve has been replaced and now a bearing. what in the hell did we get into!!!!!!!!!!! My husband and I thought we were purchasing our retirement washer and dryer, since our last one lasted about twenty years.sad,sad,sad. 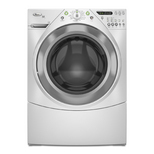 we purchased a whirlpool wfw9500 washer and dryer combo,on August 29th 2009,today July 9th. less than two years later ,the repaireman is here at a cost of 89.00 telling us the motor control unit is gone that means dead. and to replace it would cost 341.00 and a labor fee at 164.00. isn,t that the cost of a new washer in anyones book?Whirlpool need to step in and admit that there is a problem with this model and give customers with less than two years purchased a different washer. F35 and Suds backordered defective part. Hope they have the same fate as maytag did with there defective front loader. Bought this model in 2008. No problems for first two years. Over the past month, continuously getting the 'sud' and F35 error messages. Repair man is on the way. Sounds like this is a chronic problem having read other reviews. Need a class action suit against Whirlpool! I'll never buy another one. Well, I purchased this set in Sept. '09. This Sept. the pressure switch was replaced under manufacturer's warranty. In Oct., the computer boards were replaced under extended warranty. Repairman came out today due to f-21 errors. He is ordering a pump and door latch. The door latch has been a mild annoyance, but this is the first repairman to catch that it needs replaced. There is a noise in the back now and I'm guessing from previous reviews there's a bearing that will need replaced soon. The switch costs $140, the boards $300, the pump $100 and the latch $50. I have an extended warranty, but that does not make up for the fact that I have been without a washer three times in little over a year and number four is just around the corner!!!! I would have given it a 5 star rating until the 2 service calls on a unit that is less than 2 years old has cost me 4 days of work waiting on a service tech and $850 worth of repair bills. First thing that went out was the pressure switch which controls the water level. This part plus cost of replacement was $129 for the service call and $125 dollars for the part. Second service call was $129 for the estimate $450 for the part and $60 for the second call to replace the part. Drum support bearing has gone bad. To replace the bearing the whole drum has to be replaced. It is just my wife and I very light washing. The machine was purchased in 12/08 and installed 08/09 after rebuilding our home after IKE the hurricane. My son whom by just luck has the same machine and his drum support bearing are also gone out. His machine is newer than ours but does have more use because he still has 2 kids at home. There is problem with this bearing and the way it is designed and Whirlpool will not accept reasonability for a defective product. If the machine is out of warranty you are out of luck. The odds of 2 machines in the same family with the same problem have to be a poor product design and support. So after paying for the same machine twice nothing has been saved in energy or soap. So I will give it a ½ star at best. Mine lasted 18 months. I've had the SUDS, F35, F21 error codes and some repairs. The door not unlocking has also been a problem. I give up. I'll only be happy if I stop somebody from buying a duet with this review. USE APPLE CIDER VINEGAR. HEAT UP ON STOVE. WASH BOOT INSIDE AND OUT, WIPE DOWN TUB, POUR REST IN WASHER AND PUT THROUGH NORMAL WASH TO CLEAN DRAIN AND PUMP. PLEASE SEND ME $50 FOR FIX!! I have been through all of it,,the F5?,,door locked no wash. There is a fix W/o a serviceman but you must search (sorry room-mate found it)..I just kept unplugged and waiting for over an hour and it would reset. Now (and ZI noticed someone else commenting) my clothes are smelling!!! I thought it was was the drain but I have used bleach plus vinegar, hot with nothing. There is, too my knowledge, NOTHING that should cause this!. If any one has more knowledge or a fix please post it!! wHEN IT WORKS IT IS GREAT BUT HAVE HAD REPAIRMAN OUT 3 TIME BECAUSE OF CODES F35 AND SUD. FIRST STEAMER REPLACED NOW WATER LEVEL PART NO.w10249845 SWITCH REPLACED. WILL TEST THIS WEEK. My Whirlpool has been repaired 5 times since the purchase date May 20,2009. I would like to return for a refund, but hhgregg just keep sending service techs to check things out. I bought this unit (with the wed9500tw dryer) a couple days ago. The delivery people brought it out and installed it and it works FLAWLESSLY. The spin cycle gets clothes MUCH drier than my old unit. I can wash 2x as many garmets and use 80% less water. I can't wait to see the savings on my electric bill.